I was invited (challenged?) to comment on Ares concerning my last posting where I covered Bill Sweetman's latest assault on 'all things F-35'. I commented, leaving a link to the post. I considered the possibility that it was a setup of sorts, but wasn't concerned as much as curious as to what he had in mind. Tonight I checked back at Ares, and Sweetman had responded. I was somewhat disappointed in the response and can dismiss it rather easily. So I tried to post a response tonight (Can't sleep, been sleeping all day and all weekend trying to get over the bug). Odd thing happened though. My attempt to post the first part of a two-part response just seemed to hang up in the process. I had broken my response in two to match format limits, but that won't be necessary if I post it here. I'll try and post at Ares in the AM to see if the 'glitch' has cleared up. If not, I'll add it below, and change the title to "Journalists Who [Apparently] Have no Critical Reading Skills Either" . (Sweetman) You appear to be trying to make two points. I did make two points. (Sweetman) Rather than my $60m current URFC, which I based on three consecutive years in the most recent SAR, you claim the figure should be $80 million. NO. I did not 'claim' the figure 'should be' $80M. I demonstrated that, just as Thompson indicated “by perusing the Pentagon’s Selective Acquisition Reports”, such information could be found. I identified information in the latest SAR that I saw as perhaps clues to the $80M figure that could be found in an earlier SAR. Those clues led me to information in an earlier SAR: the immediately preceding 2011 SAR. Whether estimating then-year unit cost off the base year cost or simply dividing then-year total cost by the units – both arrive at a value close enough to be ‘about’ $80M. (Sweetman)You base that number on one estimated 13-aircraft "close-out" buy in an older report. This is more accurate... exactly how? because it was in the program of record at the time. because it reflected actual expected annual quantity buy and costs [which are the most current values for cancelled 2014 buy]. most of all because it reflected a single-year procurement price, as the previous years that you chose to ‘average’ include the benefit of a multi-year buy [and FMS price support]. because it also reflected the fact that there were no E-18Gs programmed at the time (for the first time in years) and were therefore not also providing price support 'off the F-18E/F books'. As an aside, though the 13 E/Fs disappeared for 2014 in the 2012 SAR, [we find] 21 EA-18Gs have been added for 2014 in the 2012 SAR. They, of course, are more expensive as well. My first point is therefore made: Facts are in evidence that indicate substance behind Thompson’s $80M figure and [intelligent people may deduce that] therefore indignation and/or incredulousness were unwarranted. (Sweetman)Then, you dispute my estimate for the 2001 cost by using a different inflation factor, called "economy cost". (Sweetman)But the Pentagon doesn't use it - and neither does anyone else. A Google search for the term (in quotes) does not show it as a method of calculating inflation in its first four pages. If I add the words "inflation method" to the search I get two hits - the source that you link to, and your page. Since my point, again, was that without more data ANY evaluation is futile, this is pretty much a ‘red herring’, but I’ll play along. You would have had better luck with Elsevier instead of Google but not by much. First, because ‘Economy Cost’ is a pretty esoteric term. Second, “Economy Cost” is one of those word combinations that will yield multitudes of results far more popular and unrelated or at best peripheral: akin to looking for information on the web concerning incubating eggs by typing in ‘hot chicks’. In any case, the ‘website’ is part of a project run by two economics professors, with about a dozen international members--apparently all of them also economics professors--on their project advisory board. Ergo: ‘somebody’ uses it. BTW and not that it matters either: DoD uses OMB inflation figures, it may be authoritative for DoD estimating but not necessarily ‘accurate’ for a 'true' perspective . In DAU it is taught that DoD estimating methods are often disconnected (lower) from methods used by the rest of the world, because “OMB inflation rates reflect policy goals rather than a consensus of forecasters”(link: a dot mil site: ignore warning to view). That's an interesting pedigree isn't it? Bill Sweetman takes exception with Loren Thompson’s ‘math’. Let’s take a look at the complaint for any validity, shall we? As Thompson says, “these numbers can be verified easily by perusing the Pentagon’s Selective Acquisition Reports.” The latest SARs for the F/A-18 and F-35 can be found here and here. So let’s look at the key claims. The URFC of the F-35C is about right. But in then-year dollars, the URFC of the Super Hornet over 2011-13 averages $60 million (page 18 of the Hornet SAR). So what are the "electronic defenses and targeting systems” that would raise that number by $20 million? Targeting pods run about $2 million, and the ALQ-214 jamming system has been under $1 million per aircraft historically. (The SAR is not very clear as to whether those are included in the URFC.) The new Block 4 version of the jammer is higher, but any identifiable mods to the Super Hornet are still a fraction of the $20 million that Thompson is adding. Today, the F-35C costs more than two Super Hornets. On Page 28 of the same report, we find one entry under called “Quantity variance resulting from a decrease of 13 FA-18E/F from 565 to 552.” This entry, combined with the 2014 'blank' space in the table columns he was looking at should have prompted Sweetman to look at the previous F-18E/F SAR for more info. It turns out, the FY2011 F-18E/F SAR had an entry (pages 17-19) for 13 units in 2014. Depending on which data you choose to use in the 2011 SAR, and in one case how you adjust from $FY2000 base dollars, it works out that those 13 units would cost between $78.9M and ~$80M each. Page 17 values are 13 units for $1.026B (Then Year Dollars) = $78.92308M each. Page 19 values, 13 units for $61.07M (Base Year 2000 Dollars) + adjusted for inflation to 2012 dollars* = $79.4M each. Call it “about $80M”, just as Thompson asserts. So why the unit cost jump? Look at the SARs. From a glance it looks to be all about Quantity and FMS price support. Like They Say on TV: But Wait, There's More! The 100th Super Hornet was delivered in the Fiscal 2001 batch. According to the SAR, the then-year URFC was $61 million. A standard Pentagon inflation calculator raises that to $77 million in 2012 - $33 million less than Thompson’s figure. The F-35 is 43 percent more expensive if it is indeed $110 million. Without the quantification of all “the necessary electronics included”, or estimation method used Thompson’s figures aren’t really debatable. Sweetman citing a ‘standard Pentagon inflation calculator isn’t very descriptive, but the 2001 Superhornet values he chooses to use comes close to adjusting the 2001 F-18E/F URF the same as if using the Historic Opportunity Cost inflation adjustment ($77.6M), which is a far better choice than most make, but it still does not invalidate Thompson’s claims if he uses another recognized inflation adjustment method, such as that for ‘Economy Cost’. Economy Cost adjustment of the 2001 URF yields $95.5M per aircraft (without electronics) in 2012. Sweetman appears to be just trying to pile-on with the last complaint. Overall, his editorial fails to ‘disprove’ or cast doubt on anything except some people’s grasp of economics and defense spending. Perhaps Sweetman’s well-known target fixation on the F-35 was his undoing this time around? No doubt the innumerate will still be impressed. UPDATE 28Jan13 : at the 'Ares' site, after trying more than once, it was still impossible to post a substantive rebuttal to Sweetman's mischaracterization of this post in the comment thread so I posted it here. I’ve been wanting to post a short ‘practical’ (versus esoteric) review of my current ‘first choice’ among my carry weapons for bit, but as regular visitors know I have been ‘busy’. During the latest gun/ammunition ‘scare’ I got tired of not being able to find either 9mm, or, especially .380 Auto ammunition (practice and defense). And the .380 is far more expensive to shoot to begin with. I like to keep a ‘comfortably’ proficient skill level, and you can’t practice shooting what you can’t get ammunition to put in it first. During the ‘rationing’ I noticed that two calibers in particular were always available: .40 and .45. As “concealability” and “controllability” are co-equal in my mind, I ruled out the selection of small .45s, though I did hold up making that decision for a while until I could try out the Springfield Armory XDS. I shouldn’t have waited: the gun felt like a brick to me. Being left-handed, it also required too much opposite-hand manipulation for my taste. The .40 cal ammo NEVER had the price spike, or empty shelves due to rarity where I live. In addition, the .40 caliber rounds stayed as cheap or cheaper as the 9mm before the run on ammo. I wasn’t looking for a Kahr, but I found one. I liked the way it fit my hand, always the first test a weapon has to pass. I found I could work the slide catch with a knuckle of my left-hand trigger finger while pulling the slide back with my right hand (we lefties adapt to the right-handed world). A real plus was the 'rightie' magazine release was positioned perfectly: In no way will I accidentally drop the magazine with even the tightest grip. 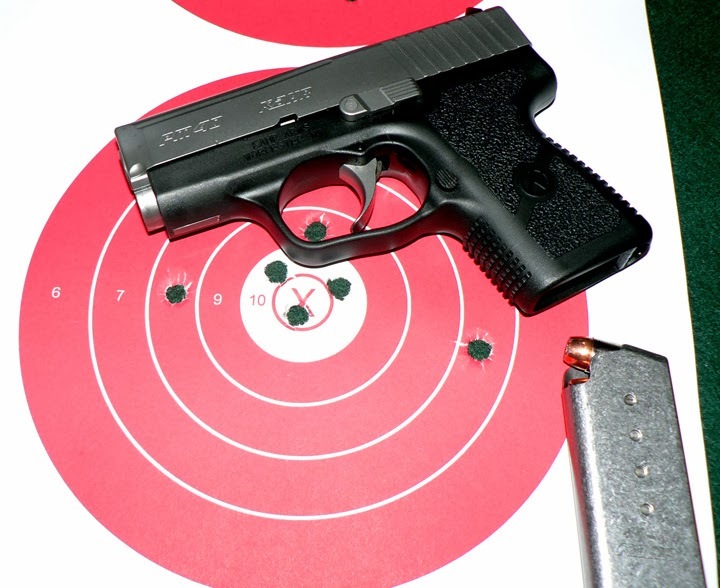 I read up on other's experiences with the Kahr and some were not very encouraging, but I liked the gun enough to give it a try, and already had an idea or two about what I would do if I experienced the same problems others had. As an engineer who had a lot of wrench turning experience, and have handled a lot of the older weapons, I understand that anything mechanical is subject to a ‘break in’ schedule. 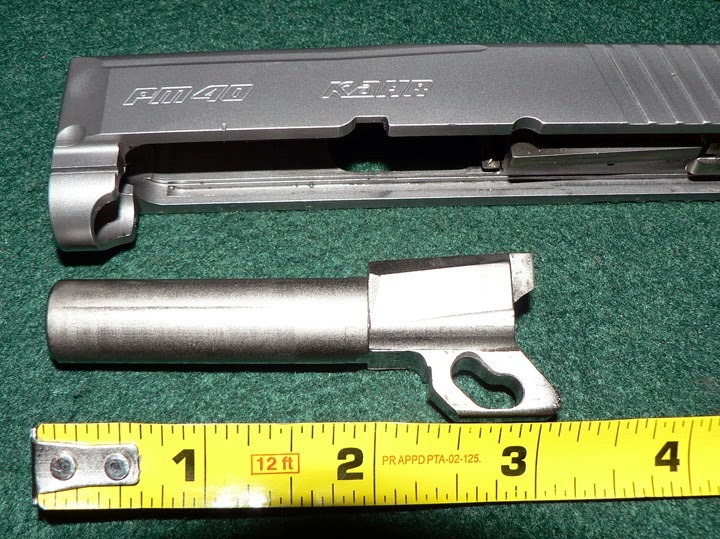 I was intrigued most about the promised accuracy of the PM40’s barrel with its polygonal rifling. The barrel is also ‘crowned’. The polygonal rifling makes the inner diameter look like it was shaped by pulling a small stop-sign through it while twisting the sign all the way. There’s no real rifling in the conventional sense, just a twisting octagonal shape. It is said to be a ‘match target’ barrel compared to the less expensive CM40 with its conventional rifling –and based on my experience to date, I believe it. OK, that’s ‘esoteric’ enough. I only mentioned the barrel specifics because I really do think it makes a difference. As does the DAO trigger, which only ‘feels’ DAO on the first round. All pulls for the remaining rounds are particularly smooth. Not as smooth as my Walther, but the Kahr is easily ‘second place’ in trigger pull category for what is in my gun safe. I really like the standard “drift adjustable, white bar-dot combat sights”. They’re very good in all but the lowest light conditions. I can get my sight picture very fast: just “dot the i”. It runs most of the .40 caliber ammo, and all of the defense rounds I’ve tried without difficulty, but I avoid the particularly wider-faced ball ammo, because it’s a tight fit for the offset feed ramp. Not a problem, I have a lot of different suppliers to choose from. I really don’t like the ‘extended’ 6 round magazine. After the last round is fired, it is hit or miss as to whether or not the follower will come all the way up to lock open the slide. Needless to say, I don’t carry that mag—it is “range use only” until I ‘solve’ it. Besides, I don’t like the extension for concealment reasons. The extra bulk is not worth just being able to reload one round later. I had to de-burr a little bit of obvious metal off one of my 5-round Kahr mags (made in the USA!). Every other kind of malfunction has disappeared after about 200 rounds had been fired through it. This gun, unlike the Walther, had to be broken in. But it was worth it. 2. I use an UpLula mag loader for the Kahr, because the magazine springs are stiffer than any gun I’ve ever seen. The first time I put a couple of hundred rounds downrange my fingers were sore afterwards. I’ve never had that happen before, so I got a loader for the next time. Kahr suggests inserting a small punch or screwdriver through a hole in the side of the magazine to restrain the spring during disassembly--you will still deal with flying parts if you are not diligent. 3. Without the extended magazine, this weapon is very compact (~5” long). 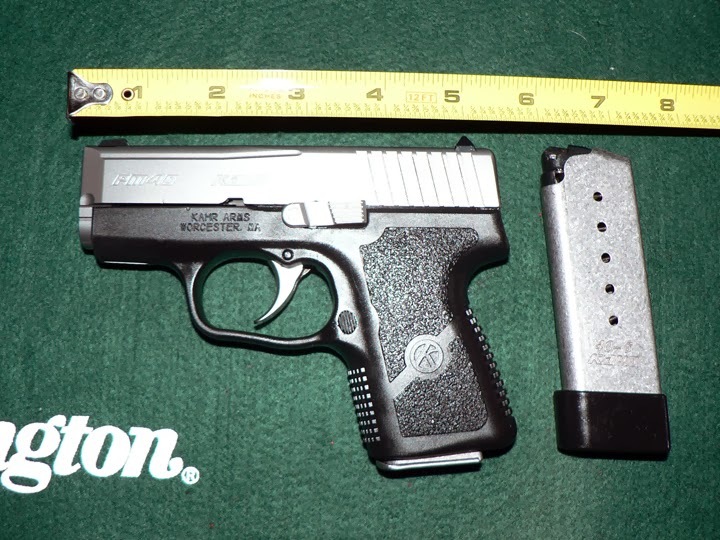 I can carry it comfortably in any pant pocket that I can carry my .380 TCP. 4. Charging the weapon reliably requires technique. Once I figured out you have to really slap the slide back, I've had zero miss-feeds charging the weapon. The recoil spring is incredibly stiff like the magazine springs. 5. 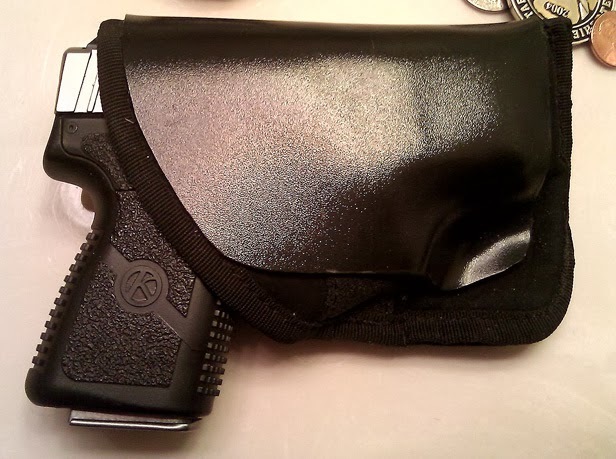 The only thing I’ve done different for pocket carry compared to the little TCP, was I put a wrap of Kydex, shiny side out, around the Uncle Mike’s ambidextrous pocket holster to stop ‘printing’ in certain pants (jeans) when I sit down. I had planned to ‘rivet’ where the Kydex practically touches, but the shape holds the holster all on its own and only comes off if I pull it off. The other side, not shown, is of course ‘flat’ and from the outside, it looks more like my phone in a pocket than my phone does. 5. Since it’s a larger weapon than the .380, you're aware of the Kahr in your pocket longer than when you carry the .380, but not by much. 6. The gap between the magazine and the bottom of the magazine well bugs some people, It doesn't bother me a bit. The stop is positive: you know when it is seated. Better than I do. I’m not one of these internet zero-MOE shooters that seem to populate every corner of the virtual world. I suppose I could be if that was all I wanted to ever do, but I don’t. I just want to shoot with less than one ‘human-minute-of-error’. The Kahr does that for me. 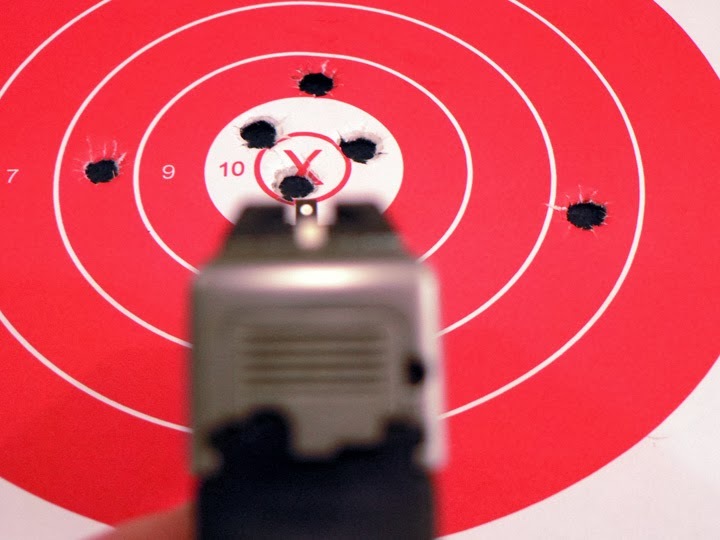 Doing ‘slow fire’, even before my eye surgeries, I could cut 10-ring sized holes out of stuff at 7 yards. (You HAVE to slow-fire at 3 yards because the muzzle blast blows the hanging target horizontal every time.) 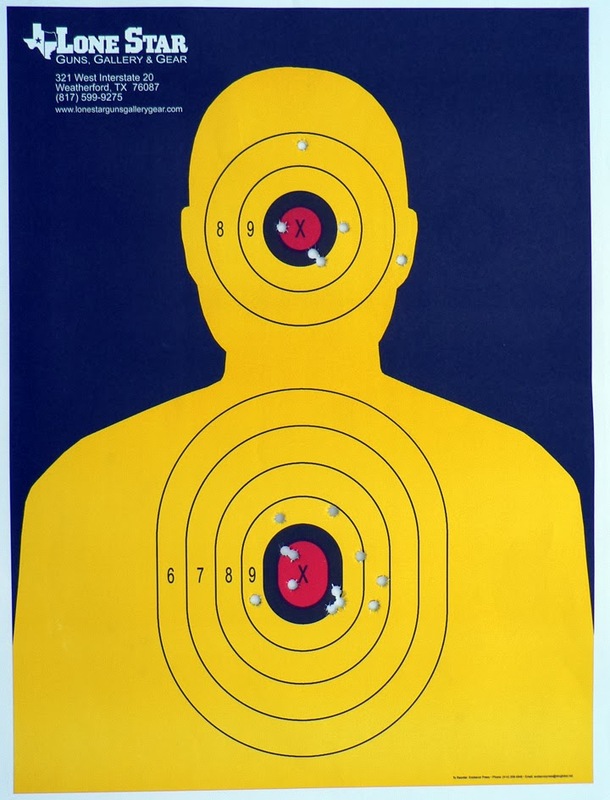 After the Chief and I did some basic target practice (she had a marksmanship class last term) I wanted to do some rapid fire (defined as 'shoot as soon as my sight picture is reacquired') practice. I loaded up the 6 round magazine and shot two 3-shot groups with a correcting pause between them at a series of six targets. Here’s a pic to give you an idea of the sight picture. This was six magazines shot from 7 yards at 6” targets in the order numbered. I was experimenting with grip and timing. 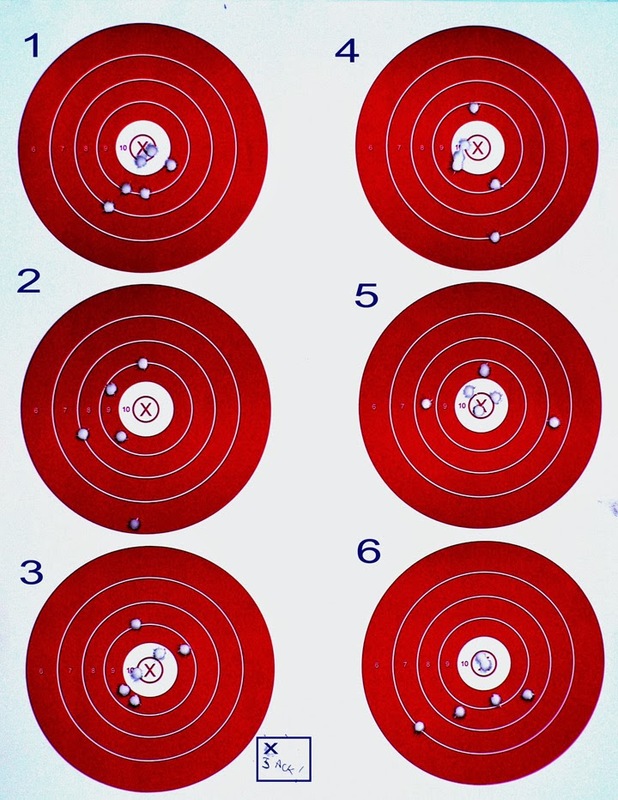 As you can tell, after I totally blew it going too fast on my 2nd target, setting loose one round (3rd of 6) waaaay down below the #3 target, I regrouped to shoot my ‘best of six’ at the #3 target, with all 6 rounds under 3” as a group. I shot rapid fire 6 shots twice at the torso. The results prompted me to try and shoot the last 6 round magazine in two 3 round rapid-fire groups at the head. I made a conscious effort to “aim small to miss small” and factoring for range, my angular error in aiming was smaller at 15 yards than it was at 7 yards. The 17th of 18 rounds would have been non-lethal. Concealable, Controllable, Reliable. I can live with that. The AF "had to" buy a CAS plane? I confess. I wanted to do this post first in this “2nd Edition” series to keep things in chronological order, but I believed at the time that this myth required some significant off-site research of Government and other documents; it required deeper investigation of the original sources than the myth we exploded in Part 7. Part of the delay in completing my research also came from the Government Shutdown Theater last year, and an off-line 40K word writing project I completed on New Year’s Eve. Today, we go back to the roots of the modern CAS mythology to examine what drove the ‘birth’ of the A-10. 2. Employed both by the incompetent and the malevolent to create ‘cartoons’ of history. There is no doubt that the Air Force factored in the ‘external’ pressures into its decision-making. There are always many forces when shaping major decisions, and we will be covering only a few of them. But external pressure was hardly the only or even primary reason. Nor does the mere existence of the ‘external pressures’ mean those pressures were legitimate, honest, or well-founded. I believe we can show that many, if not most of them, can be filed under ‘none of the above’. I’ve seen variations on the ‘had to’ claim go so to such extreme wording as to actually read that the Air Force was “shamed” into fielding the A-10. I’ve purposely phrased the myth definition in this discussion as the broadly stated “due to external pressure” to allow readers to discriminate between, and discuss the nature and sources of pressure individually as well as explore their interrelationship along with some common roots as we proceed. The myth is also tough to nail down and debunk because it is so poorly defined: there is a level of abstraction that could mean different things to different people. To deal with this complication, we will break this myth down into what I have found to be the two commonly intended meanings behind the myth. Thus, we will be exploding two myths instead of one to make sure we address the multiple wrong-headed ideas behind the statement above. If there are other meanings, I do know what they might be. But if they exist, I’m certain somebody will let me know. 'The Air Force never wanted the A-10 specifically. They 'had to' buy it. 'The Air Force only procured a dedicated (generic) attack aircraft because they were ‘made’ to do so. The first myth can be considered a specific example of the second, but we will deal with each as a separate point, because they both have been repeated often enough for each to have taken on a provenance all their own. They appear to me to exist independently in some people’s minds: one, the other, or perhaps sometimes both. By addressing both versions, we can avoid the ‘yes but’ argumentation from those who would first argue one point, then upon being shown where they are either completely wrong or oversimplifying, try to avoid facing up to the facts by simply running to the other meaning. There is a large set of undefined “or else” implications behind both these assertions. No doubt some of those consequences factored into the Air Force’s decision-making process (no defense decisions are ever made in a vacuum), but in both cases we can show that in every step of the evolution in Air Force close air support ‘thought’ from 1960 onward the Air Force decision-makers were always focused on providing the best possible ‘Close Air Support’ to the Army within the externally imposed limits of available technology, defense policy direction and budget-limited force structure, and show that CAS capability was pursued according to the rapidly evolving criteria by which ‘best possible’ was defined. I’m going to cover this myth using a different approach than Part 7. Instead of starting at the present and following the thread backwards in time, for this installment we’ll start with the moment the A-X program was initiated, covering who, what and why. Then we’ll ‘flash back’ in time to look at the activities of key actors, first picking a convenient starting point in the past and then look at their activities running up to the decision. This approach is warranted because there were many threads of concern and action, including those involving the A-7 as the ‘interim’ CAS plane acquisition program. These threads converged to create the whole history. ‘Convergence’ for our purposes is the point where the AF leadership decided to undertake development of what would become the A-10. We’ll also go a bit further to show how the AF defended the A-10 program after it was underway to further remove any reasonable doubt. After exhaustive investigation, at the root of all the decision-making I found that the three most important players in this story were the Army ‘Airmobile’ Advocates (of course), their enablers in the Kennedy/Johnson Administrations, and a noisemaker or two in Congress. There were even deeper roots to what was happening at that time-- Roots going back to even before the Korean War. But we will spare ourselves from running down the rabbit hole it took me over two months of research to navigate just to get back to this point. The time I consider as well spent, but on top of all the other research I’ve done and experience I’ve gained on in this topic over decades, I’m pretty sick of CAS ‘hardware’ issues right now . We’ll save discussion of that earlier time for perhaps a later installment… or twelve. 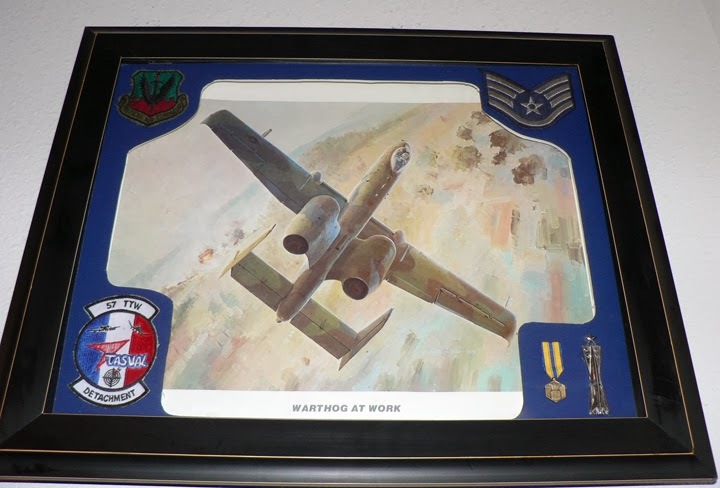 Myth Meaning A: 'The Air Force never wanted the A-10 specifically. They 'had to' buy it. Loooooooog post after the fold. Ye be Warned. I normally don’t go into my personal life beyond whatever public behavior I advocate, enjoy or regret, but this is a private behavior ‘regret’ post. The only thing that makes it suitable for publication here is that I feel I must warn others not to do what I did. I delayed getting some surgery done, which might adversely affect my final healed-up post-surgery state. The surgery was delayed, because not only did I not get a third opinion, I SHOULD have gotten that opinion…in a different state, or at least in a different part of the state I was in. I noticed I was having trouble in my right eye about 5-6 years ago when I was on temporary assignment in California. I saw an eye doctor who diagnosed my right eye as having “cellophane maculopathy” AKA “macular pucker”. He told me that it occurs in about 5% of people without diabetes in my age group. (very much higher rate for people over 70) and referred me to a retina specialist, with a warning he could probably not help me. The specialist repeated what the first eye doctor told me. Yes, he could do a surgery, but it had a very low probability of improving my vision. Why get surgery with little hope of success? I’m not masochist, and my other eye was working ‘fine’. My left eye has always been dominant anyway. I passed on the surgery and the disparity in my eyesight did cause me some minor problems, but it was tolerable. I forgot about ever getting the eye fixed. Well, after being back in ‘Merica (Texas) a few years, ‘Old Man Cataracts’ started making his presence known. 7-8 Months ago I had cataract surgery which really made an improvement in my vision. Of course, when the new doc looked in my eye he saw the old problem and asked me if I was having problems seeing detail in the right eye. ‘Duh!’ I said, and told him about my earlier experience. New Texas Doc said he he was surprised—he thought the surgery had a pretty good success rate, rarely getting 100%, but often in the 90%+ improvement range. He referred me to a retina specialist in Fort Worth for another round of tests. I repeated the story about being told success rates for this kind of surgery as being low, and the Retina Doc looked stunned, shaking his head ‘no’ the whole time. At the end of my recap, Retina Doc tells me ‘No’, they usually get in the 90%+ improvement range if there are no other problems (glaucoma, macular tears, holes, etc—none of which he saw on me). Then he asks “Where were you again when you were told there were low success rates?” I told him People’s Republic of Kalifornia. I’m certain if I had been in a big city in CA, I eventually could have found a doc with the skills, but how would I have known I got the right one ahead of time? Better to go where success is a presumption, rather than an exception if you need work done. Well I’m now two weeks post-op. Doc says I’m doing ‘excellent’, and by my estimation, I’m already in the 80-90% improvement category with the problem up close with expectations of further improvement as I heal. When the Retina Doc went in he found a small retinal tear caused by the pulling of the vitreous membrane he was fixing. It was at the top of my retina where I never would have noticed until it got bigger, so it was ‘lased’ while he was inside my eyeball. I’m certain it eventually would have had to have been taken care of for reasons of its own, so this was a good decision: even if I didn’t get an improvement, I prevented serious damage. But I’m kicking myself for not getting that third opinion right after the second. If you have morbid curiosity and a strong stomach, this is the procedure I had done. Fortunately I don’t have any other problems like macular degeneration that the patient in the video has, so my recovery is (so far) remarkably fast. Don’t assume that because you can’t find a doctor that can help locally, that you won’t find one someplace else. P.S. I backdated this so as to not run over the CAS post that I want to keep at the top for a bit.